Oh I do love finding new and exciting restaurants in London, and the Folly is my latest find. Set in the heart of the city, situated on Gracechurch street, near to monument station and within walking distance from London Fenchurch street, this is a vibrant and trendy place to be! With plenty of vegan and gluten free options on the menu, I met up for a Sunday brunch with my gorgeous fellow blogging friend Rosanna from roses rooftop, to sample the delightful menu! I did book in advance, but for two people, you can probably get away with not booking a table, but wouldn’t advise this near the Christmas period. The Folly is in a large building, which has seating upstairs and downstairs. I find it very comforting visiting this place, with comfy cushions to warm your bottom, gorgeous lighting draped around the indoor plants, menus hanging gracefully near your table and furniture that looks like it has come from Dansk, that I wish I could buy. I chose from the all day breakfast menu and opted for the delicious gluten free eggs royale with gluten free muffins and Rosanna opted for the full works! The only downside was that the chips that accompany the meal aren’t gluten free. I was offered an option of a side salad if I wanted. The menu has many vegetarian and vegan options, so you will be spoilt for choice if you are requiring any of these. The staff were incredibly polite and helpful. We both then enjoyed a lovely pot of English breakfast tea, because who doesn’t?! I was only able to choose one option for dessert, and that was the lemon sorbet with roasted pineapple, drizzled with nuts £5.95. It was a nice combination, although I don’t usually opt for sorbet. 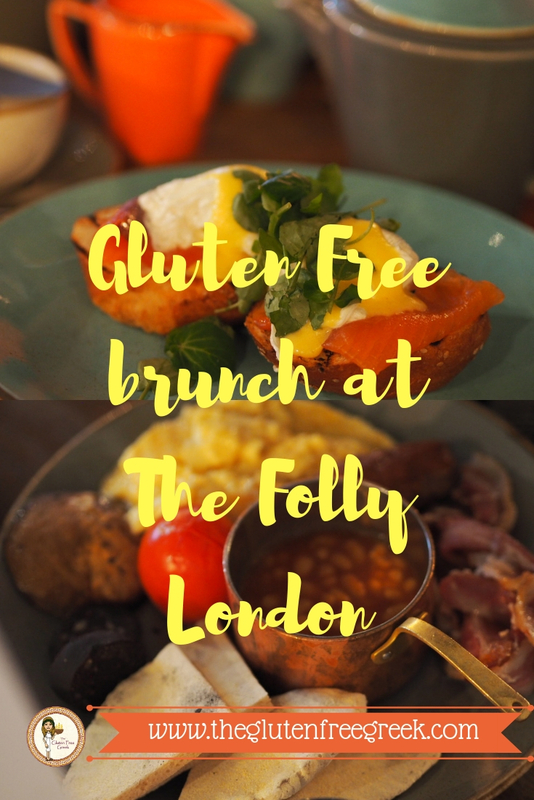 I will be going back to The Folly for an afternoon tea, as they serve up gluten free scones! The Folly opens till late so if you are looking for your final destination to end the night, The Folly’s music and late license on Thursdays and Fridays give you the excuse you need to keep on partying! So why not escape to the Folly and experience the Folly vibe! What’s your poison? Tempting cocktails and mocktails make this place a popular place for after work drinks or weekend parties! Easy to get to from Monument, Liverpool street or London Fenchurch street. The Folly has a lot of space with seating for large groups and smaller groups. It is very comfortable dining, and I didn’t feel rushed at all. I am also in love with the botanical garden effect! If you are looking for a nearby hotel to rest your weary head for the night, then check out the Tower Hotel, closeby to Tower hill and overlooking tower bridge.